Many writers have described seemingly far-fetched inventions that eventually leapt off the pages of a manuscript and became a reality. E-readers, closed circuit television, credit cards, universal translators, and “smart” homes are all good examples of reallife tools that had their start in fiction. In some cases, the authors’ imaginative ideas anticipated the technological and social developments that would lead to innovation; in other cases, inventors were inspired by what they read and worked to make those literary products and processes a reality. Either way, this is a powerful example of how fiction can help readers to envision and connect with the idea of astounding new objects unlike anything in their own contemporary universe. The collision of science and literary art has also had enlightening effects beyond the technological realm. For example, fiction has helped readers learn about and consider the ramifications of genetics (as in Michael Crichton’s Jurassic Park and Guillermo del Toro’s and Chuck Hogan’s The Strain series), computing (as in Robin Sloan’s Mr Penumbra’s 24- Hour Bookstore and Neal Stephenson’s Snow Crash), and astrophysics (as in Cixin Liu’s Remembrance of Earth’s Past trilogy). One field that has been surprisingly absent to date is conservation science and its ecological underpinnings. There are certainly stories with pro-nature themes—Barbara Kingsolver’s Prodigal Summer uses the character of Deanna Wolfe to send the message that top carnivores should be treasured rather than hunted; Laline Paull’s The Bees takes a stand against pesticide use and the overdevelopment of urban spaces; EO Wilson’s Anthill is both a blatant indictment of destructive human activities and a rallying cry for conservationists. These narratives, however, occur in our own, familiar world—unlike science fiction stories, which tend to plunge the reader into more unfamiliar settings by sending them off to the future, out into space, or onto an entirely different planet. There is something powerful about that total immersion, which can force readers to grapple with focal issues and ultimately lead to a more visceral response to, and connection with, the material. Surely this is exactly what is needed to generate a sense of urgency about the environment. The potential of this technique is on full display in the work of Paolo Bacigalupi, who is best known for the Hugo Award-winning The Windup Girl (2009), The Locus Award-winning Ship Breaker (a young adult novel, 2010), and his most recent publication, The Water Knife (2015). Bacigalupi’s settings are dystopian, resulting from environmental degradation caused ultimately by human greed and an unwillingness to admit and respond to the reality of incipient environmental disasters. 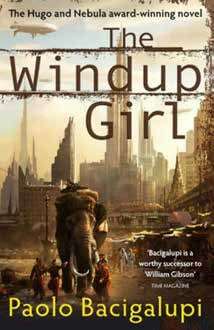 The Windup Girl explores the impacts of sea-level rise, fossil fuel depletion, and misuse of biotechnology. Bacigalupi imagines the miserable weather conditions that would prevail in a much warmer 23rd Century, and the infrastructure that might be required to keep this hotter, wetter nature at bay. He explores possible alternative sources of energy and ponders the nearly nonstop deluge of disease we might face if we create a world filled with homogeneous agricultural crops and antibiotic-resistant diseases. 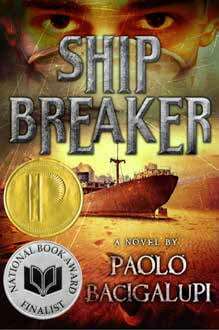 Global warming and inundated coastlines are also a feature of Ship Breaker, which, among other things, questions what type of economy might arise when humans must revert to an almost Neolithic survival mode in the wake of extreme ecological disaster. 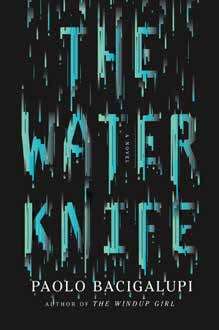 Bacigalupi’s most recent novel is set in an imagined future that is as dry as the others are wet. 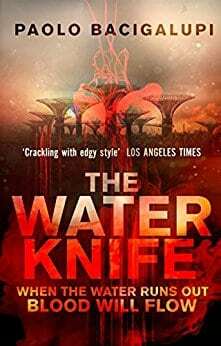 The Water Knife takes place in the American Southwest in a not-too-distant future when residents can survive only in “Arcologies”, which are apartment complexes that act as perfectly calibrated ecosystems carefully recycling and reusing that most precious of resources: water. The complex plot is based on the actual geological, hydrological, and climate conditions in the Colorado River basin, and considers the impacts of politics and policy on the environment—and vice versa. The arcologies that Bacigalupi describes may not be in existence today, but are certainly the ultimate goal of the sort of sustainability architecture advocated by reallife organisations such as the Building Research Establishment (BRE). Bacigalupi’s characters drink from “Clearsacs”, which filter urine so that it can safely be consumed as clean water—not dissimilar from actual technology that has been developed for American astronauts living on the International Space Station. Each of these novels is primarily about people: what they believe, how they react to different situations, how they interact with each other, what they are capable of. These things can, of course, be explored in any fictional setting but are particularly poignant in the context of a hypothetical future ecological disaster because most readers will recognise that we are, in real life, standing on the brink of such a disaster right now. Bacigalupi’s descriptions— whether of an agricultural crop succumbing to a devastating pestilence, or a corporation greedily acquiring natural resources at any cost, or of regular people refusing to help each other in times of crisis—are all too familiar. The books may be fiction, but they are, quite obviously, based on truths. The horror of Bacigalupi’s imagined futures is strikingly well realised and is, therefore, both memorable and motivating. Within a few chapters, readers are likely to find themselves monitoring electricity and water use, rethinking what they buy in the produce aisle, appreciating the biodiversity outside their windows, donating to a conservation group. The worlds in which Bacigalupi’s fiction occurs are not places we ever want to find ourselves, and so it seems prudent to make better choices in our own world now. It doesn’t hurt that the stories have intricate plots, excellent pacing, and realistic characters; these features just draw the reader even further in and make the events of the books all the more compelling. Conservation-minded authors should consider taking a page out of Bacigalupi’s book—no pun intended—in order to better help readers comprehend what scientists really mean when they raise warnings about environmental issues. Rather than talk about how many metres the sea level might rise, create a fictional world in which that has happened and think about what it would be like to live there. Instead of saying that invasive species are pushing out ecologically important natives, describe a future where invaluable ecosystem functions are missing and consider how humans might have to deal with the resulting stresses. When people are drawn in and can imagine themselves in those circumstances, the implications suddenly seem much more real—plus there is always the chance that a creative writer could come up with a solution that can be implemented in reality. It may seem a bit far-fetched to suggest that literature could have a noticeable impact on public opinion and policy, but there are precedents. Zombie apocalypse stories such as The Walking Dead have sparked discussions about serious issues like morality and the meaning of civilisation, as well as prompting people to learn a few survival skills and stock up on canned goods “just in case”. As these stories have increasingly captivated the public imagination, zombie apocalypse scenarios have been run by public health officials practicing for major disease outbreaks, and by epidemiologists modelling transmission patterns. If authors created equally engrossing tales about environmental apocalypses, might that open more dialogues about the relationship between humans and nature, and perhaps lead to greater awareness and more eco-friendly behaviours? Could it help readers better visualise a world with harsher weather, fewer ecosystem services, and less natural beauty? Bacigalupi’s canon suggests the answers to these questions might just be “yes”. Writers, consider this your call-to-pens.